Personalised Caravan Owners Tea Towel, with a name or names of your choice to this unique gift. Personalised Caravan Owners Tea Towel, with a name or names of your choice to this unique gift. A fantastic gift exclusive to AmysGifts.co.uk for all caravan owners to brighten up their home from home. We use natural cotton tea towels hemmed on all the sides. 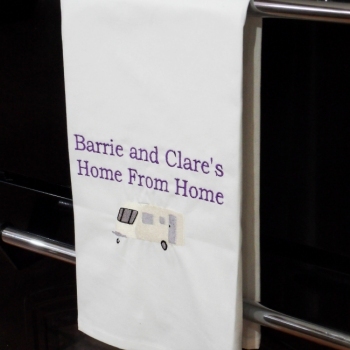 Personalised Caravan Owners Tea Towel, with a name or names of your choice to this unique gift. A fantastic gift exclusive to AmysGifts.co.uk for all caravan owners to brighten up their home from home. We use natural cotton tea towels hemmed on all the sides. A good size tea towel at approx 52 x 72cm. Choose the Text. Our example reads Home From Home however you can have any names or little message you want in place of this! Choose the text colour. We offer two different text styles - fancy script or print. We will produce your gift especially to order and ship your unique gift to you or your chosen recipient. At Amys Gifts we do all our own embroidery work especially made to order and do our best to get all orders dispatched within 48 hours, however it may be necessary to allow a few extra days near holidays. It is always advisable to order as far in advance as you can. Any queries or special requests please email us.